The Wink Slots Casino was launched in 2016 and is part of the famous 888 empire. The casino is a fresh new player on the market and they came up with some stunning offers and great games to keep the casino fun. Their mission is to give players what they want and what they deserve. In our WinkSlots casino review, we had a closer look at the casino and tested all the features, games and bonus offers. 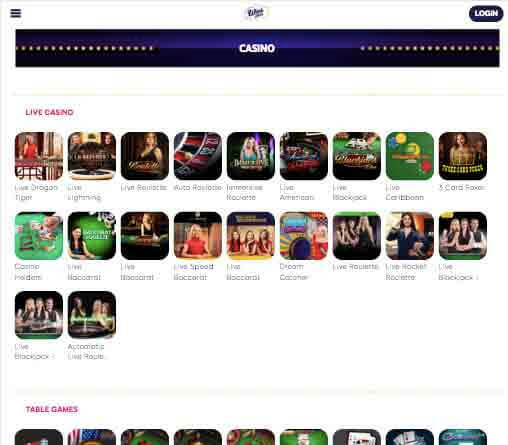 We went through all their sites and features and will give you all the insights you need to play in the casino. They have a playful and lively site with a lot of features and bonuses. Their selection contains over 200 slots and other different games. The Wink Slot casino is a fun casino with a great welcome offer several hundred games for any possible taste. In our Wink Slots casino review, you can find everything you need to know to get started and to get to know this fun and new casino. Let’s get started. Nice design and fun website. Big selection of slots and other casino games. There are many countries where the Wink Slots site is not available and that is mostly due to the local restriction of some countries and due to licenses and their regulations. One example is the USA, as they do not allow any non-US based online casinos. Then, Australia is another country, that just restricted any gaming activities online. The Wink Slots site has the licenses from three gaming authorities – Gambling Commission, Curaçao eGaming and Malta Gaming Authority. These licenses assure a legalization in most of the countries and allows activities in many countries around the world. Places like Bulgaria, Denmark, Estonia, France, Italy, The Netherlands, Portugal, Romania, Spain and many others however are restricted to using the site and cannot create any accounts there. Under the terms and conditions on the casino site you can have a look at the full list of the restricted countries. In that way you can be sure that your location is not among the list. Just keep in mind, that you have to be at least 18 years old to register in any online casino, including Wink Slots. Additionally, to the mentioned countries, all countries with the legal framework which restrict the online casino sites, are also prohibited from playing in the casino site. The main accepted countries are the UK, Canada, Ireland and New Zealand, among others. If you are a resident of any of these countries, you can register and play at the site without any concern and enjoy all the features of the casino. Other then the mentioned countries, most of the other European countries are eligible to register and play at the casino. The casino has a broad selection of software providers on board with them. With their experience, they know who the best in the business is and work with best providers around. Their high-quality casino games come from the top-notch software providers that out there. Some major players here are the traditional bookmaker Microgaming, famos NetEnt, Nyx Interactive, Play’n GO and many others, they also teamed up with less known providers to guarantee a vast variety in the game selection. These software providers have some of the biggest and most fun games out there. One of the best examples is NetEnt’s game Starburst. That game became somewhat of a sensation right now because of its huge fame online and the great opportunities to win. So it is a given, the site also offers this popular game and many other NetEnt games, like Gonzo’s Quest and live casino games or card games. Secure and fair website with SSL encryption. More withdrawal limits than deposit limits. Customer Support is not available 24/7. The site is well structured and easy to use. Even newbies will find their way around in no time. The menu on the top leads your directly to the important features, like slots and promotions. Also, the jackpot games are just one click away and they even run a magazine to keep you updated with the newest trends and industry news. The game section is divided well and you will be able to find your favorite game with no confusion. The games themselves run well and load really quickly. We could not spot any technical issues and flaws. The site and the games run really smooth. That is also true for the mobile version of the casino. A great option is the menu point of the popular games at Wink Slots, so you will be always up to date on the hottest games in the casino. The Wink Slots casino loves their slots and they have their main focus on the colorful slot machines. They offer a huge number of slots for every possible taste and player behavior. The site has a great focus on classic looking machines with fruit optic but they also really nail the modern and innovative games. The fruit slots and classic designed games remind us of the old casino days and physical slots in pubs and casinos and have a great nostalgic factor to them. But the casino does not stop there and they created a broad selection of new video slots and other innovative machines. They come in a new and flashy design for those who are looking for something else and more innovative and exciting than a fruit slot or a classic 3-wheel machine. Games like Starburst are some of the top games at the casino and they even come with great bonuses. They also have some progressive jackpot slots with big jackpots to crack. In fact, they can really show off a broad jackpot selection with really high winnings. They also really shine with their selection of bingo. Apart from Slots the casino also offers a lot of different table games and a broad live casino section with interactive tables. There are several different types of Roulette and Blackjack and other card games and table games like Baccarat. Although they are mainly focuses on the slots they offer variety in their games. There is even video poker section and some dice games at the site. Their live casino selection might be bigger at some casinos but at Wink Slots there are some great games and they even offer a promotion for those once in a while. The Wink Slots casino offers a stunning welcome package and is also keeping the players happy with regular bonuses. You will get 30 free spins upon registration at the site. That is a great way to test the casino and the performance of their games. But of course, you will also get a bonus on your first deposit. The casino offers a match bonus up to £400 and 50 free spins on top of that. The minimum deposit for those offers is at £20. Just use the bonus code: BIGBONUS for your deposit and you will receive the bonus. And speaking of regular bonus offers, the Wink Slots casino has one almost every day. There is a daily challenge to win bonuses like free spins and other offers. There is a special offer on Mondays that turns every spin into a win and on Wednesdays they offer a wheel of fortune with huge free spin offers for different games. And there are many special promotions on the weekends too. There is always a suitable bonus offer at the Wink Slots casino. We really recommend to check the promotions site on a regular basis and also have a look at the magazine the casino offers, as they will announce special promotions there as well. Another great way to stay updates is to subscribe to the Winks Slots casino newsletter. In that way you get the best bonus offers just right into your email inbox and you will never miss out on a promotion. A mobile casino site is the best way to have your casino fun available at any time and at any place. It gives you a lot of flexibility. With a mobile casino, you can play on the go and never miss out on a promotion or new game release. It is a great way to keep up with your gameplay in boring waiting situations in a shop or at the doctor’s office. It is a perfect option to let time pass quicker and do something fun. It is also a good way to just relax at your couch. The casino even offers an app for download. You can just get it at the Apple store or the Google Playstore and you will have access to all of the Winks Slots games right from your app. During our Wink Slots casino review, we of course also tested their mobile website and the casino app. The site runs on a very efficient instant play system and that makes I very easy to use. You do not have to download the app for it and can still enjoy all of the mobile features. Although the app runs even better, the mobile version of the casino works perfectly. The site is smooth and responsive. You will be able to use the colorful site on any screen size or device. The mobile casino is also working really fast and the games load in no time, given the condition of your internet connection. You will have to keep in mind, that it runs best under a WIFI connection or a very strong mobile data connection. The speed depends on how fast your internet speed is as well and sometimes the casino has no influence on that. Thanks to the mobile site, you can enjoy the same games you would on the desktop version also on the go or just closer to your fingertips, when you are at home. 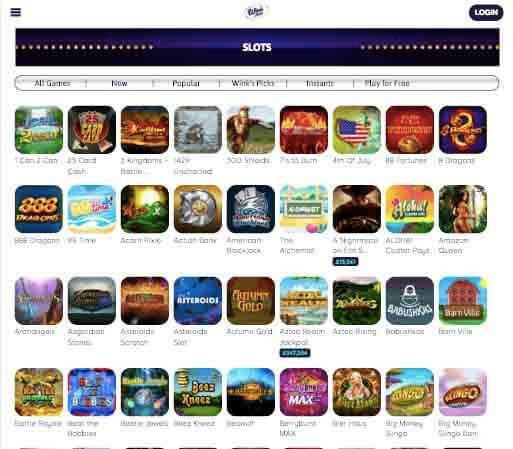 The mobile casino site runs perfectly on any iOS, Android, Windows, Blackberry phone and has no issues whatsoever running on tablets with the same operating systems as well. It also is optimized perfectly and adapts to any screen size and shape. All of the promotions and regular bonus offers are working at the mobile Wink Slots site as well and you will not miss out on any of them. The big plus of this casino is, that all of their games are also working on the mobile site. You will not have to miss out on any of them. All of your favorite slots and table games are present on the app and mobile site as well. The mobile version looks more compact and is simple and comfortable to use, it is not lacking anything compared to the desktop version and the design is even clearer and main features are the same. The links to everything are on the drop-down menu on the left side. The menu drops down from the top left side of the screen and you can select what you need. The menu looks similar to the desktop version and you will have no trouble getting around on the mobile site. The live casino selection is good at the site, although it is not the main focus and we are missing some game here. Most of the games are provided by Evolution Gaming, one of the biggest when it comes to live casino tables. There are mainly Roulette and Blackjack tables at the Winks Slots site and you can choose among different tables and themes. They could be organized a bit clearer so it easier to find one’s favorite game, but all in all they offer a great variety of games and put a good emphasis on Baccarat. That makes them different to most live casinos. They also offer Dream catcher and some Poker tables. There is not that much variation when it comes to Poker, but there is still a good selection and some choices. When it comes to payments the site is easy to use and offers a lot of different payment methods. We are convinced that you will find the best for you among all of the different options. They offer more deposit methods than withdrawal methods but they still have great options for everyone. The available payment methods at the site for deposits are Bank Wire Transfer, Entropay, Maestro, MasterCard, Neteller, Paysafe Card, Skrill, Visa, Visa Debit, Visa Electron. The available payment methods to make withdrawals at the site are Bank Wire Transfer, Neteller, Skrill, and Visa or Mastercard. The accepted currencies are mainly EUR and GBP but they also offer USD and CHF for payments. They also offer PayPal for deposits and withdrawals, which not many online casinos do. There are no fees associated with making the deposits with any of the mentioned payment methods at the Wink Slots casino. There might be some fees for certain withdrawal methods, so make sure to always have a quick look at the terms, before you request a withdrawal. Generally, all the deposit transactions are instant, where you will see the amount credited to your account as soon as you make the payment. The money reaches your casino account within no time and you will be ready to use your funds for the games. The casino site also provides quite fast cash-outs. As for the withdrawals, the pending process is maximum 24 hours. After your request is processed, the duration of the time the money needs to reach your account will depend on the payment method you choose. EWallets such as Neteller and Skrill are the fastest, with a transfer time of maximum one day so you might even receive your winnings. Credit cards might take 2-5 days. And bank transfers might take up to 2 to 7 days. The withdrawals are processed very fast and secure. The maximum cash-out the site is £5,000 a month, £1,000 per day and £3,000 per week. Some of the methods might come with a restriction for a one-time cash-out, so make sure to have a look at the terms and conditions. The customer support at the casino is a bit shaky and it is hard to get a hold of them sometimes. But all of the staff working for the customer service are indeed very friendly, and they do try their best to help you out while keeping a professional tone and attitude. They are available through email, live chat and UK Toll Free Number. As the FAQ section on the site is not the biggest it might be helpful to send the customer support an email or come to the live chat. Their phone number is 0800 018 3307, if you prefer to call them directly. E-Mail is the best way to get in touch with them as their hotline and chat are not always working. They will get back to you within a couple of hours and hopefully have a fast solution to your issue. The support is not bad but we would love to see some improvement. The Wink Slots casino is powered by the 888 group and was launched in 2016. The company Cassava Entertainment is registered in Gibraltar and is the mastermind behind many other great casinos as well. One of them is the 777 casino, 888 and many other examples. They have a lot of experience on the casino market and know what they are doing. This online casino is licensed with the UK Gambling Commission and the Malta Gaming Authority, which are the main gaming authorities in Europe. These two licenses should be indication enough that the site is considered secure and fair by the online gambling authorities. They also take care about the data added on the site and make sure the website runs safely. The Wink Slots site is not just secure but it is also fair when it comes to treating its players, that includes their straight forward terms and their transparent approach. Also, the games all run with a random number generator, to keep the end results completely random and fair. There is no way to rig the game and you have an equal chance of winning as anybody else. They are checked by authorities like eCOGRA on a regular basis. The online casino is accountable for its actions because of the licenses. Any unfair business will result in an investigation and there is a possible risk of shutting down the entire business. So, the casino takes extra care of taking things fair and compliant to their licenses and the authorities regulations. We really enjoyed testing the site and creating our Wink Slots Casino review. We are impressed with the amount of games they offer and really liked the regular promotions they come up with. Although they also offer other games, you can really see that slots are the main attraction here. We loved the fact, that they offer PayPal as a payment method and can assure that the casino is secure. We would love to see some better support in the future but other than that we really can recommend the site. We hoped that the Wink Slots casino review was useful for you and that you will enjoy the casino site as much as we did. You will for sure find your favorite slot at the Wink Slots casino.